The Dell C6145 server supports two compute nodes each of which can host four AMD processors for up to eight processors in the 2U, shared infrastructure chassis. The shared infrastructure design helps to reduce operational costs with greater energy efficiency and shared cooling, which also means less racks and cabling, and reduced space requirements. The hyper-scale inspired design allows Administrators to quickly adjust to increased demand with additional servers that can be easily integrated with the existing infrastructure. Each of the two supported servers in the C6145 chassis features up to four AMD Opteron 6200 processors with 8, 12, or 16 cores each. Compared to the previous generation, these processors deliver 73 percent more memory bandwidth, and 84 percent improved performance over the previous generation. Power is provided at the chassis level by dual hot plug, high-efficiency 1100W or 1400W power supplies. With two compute nodes installed in the chassis, the system will support up to 1TB of memory with each compute node supporting 512GB in 32 DIMM slots. Each of the four processors supports four memory channels, each of which supports up to two registered (RDIMM) modules, unbuffered (UDIMM) modules, or low voltage RDIMM modules. UDIMM and RDIMM modules cannot be mixed. Speed of processing includes 1066MHz, 1333MHz, and 1600MHz and is dependent on processor speed, memory speed, and memory configuration. Storage on the chassis is shared between the two compute nodes. All drives on the front of the system connect to either a backplane that supports 12 x 3.5-inch drives, or one that supports up to 24 x 2.5-inch hard drives. The backplane then divides the supported drives between two independent midplanes, each with dedicated controller and power connections to each sled. Supported drives include SAS, SATA and Nearline SAS drives in both HDD and SSD formats and require a specific drive carrier to mount in the C-series chassis. There are a few Storage/RAID controllers to choose from depending on your requirements. Optional Hypervisors are supported. One mezzanine card and three add-in cards are supported using PCIe 2.0 technology. The three PCIe 2.0 slots are available on two types of rise cards either a standard riser or a MicroSD riser card. A single embedded NIC/LAN on motherboard (LOM) features a dual GbE controller. Additional mezzanine and add-in cards are supported providing dual, single and quad-port connections of 1Gb, 10Gb, and 40Gb InfiniBand connections. Two additional network interface cards (NICs) are supported combining better power efficiency for space constrained environments. OpenManage and iDRAC are not installed on this system. Management is provided by third-party applications through the embedded Base Management Controller (BMC) with IPMI 2.0 and dedicated management port. 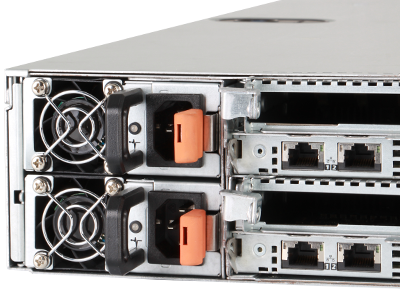 This server was one of the highest-performing servers on the market delivering up to 281% greater performance than HPE's ProLiant DL980 G7 in a quarter of the rack space—pretty impressive! The shared infrastructure platform also enables rapid scale-out, while providing better cooling efficiency combined with a more efficient use of space and power consumption.